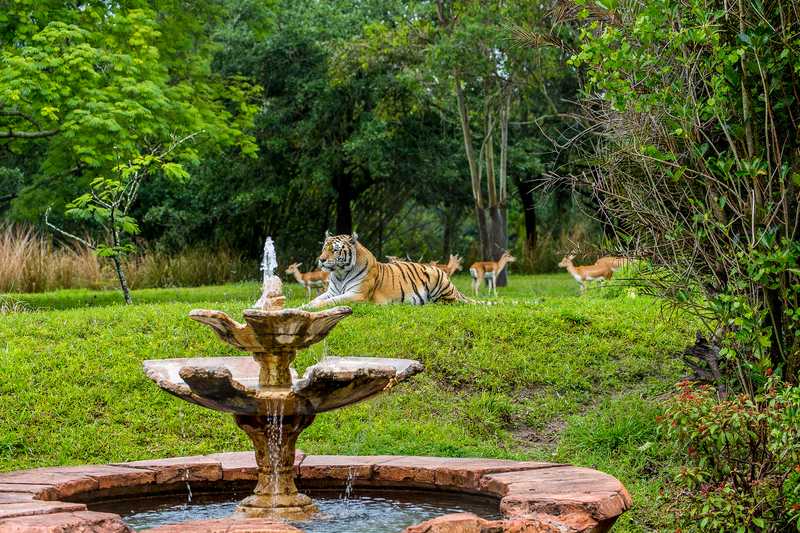 I’m going to post some of my better Disney shots here as time permits. Here are a few to get things started. 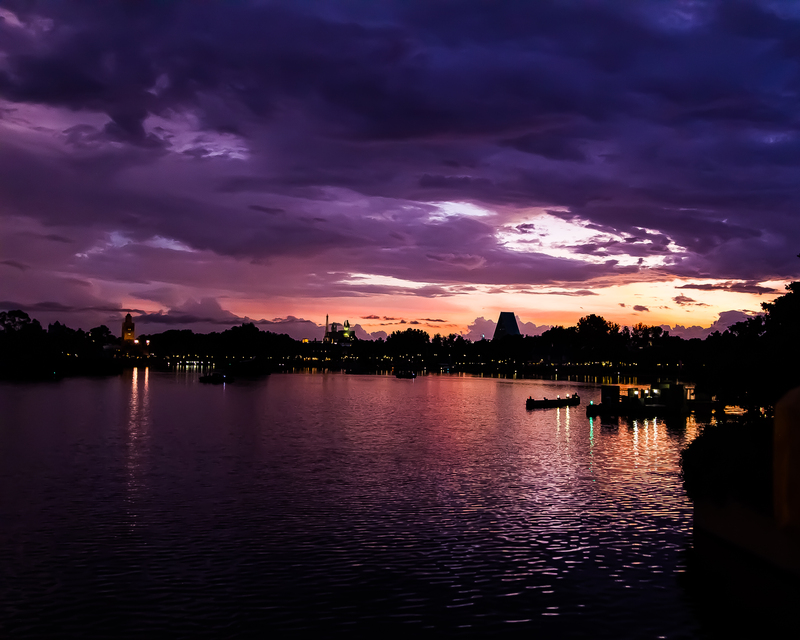 Shot across Epcot in the early evening. 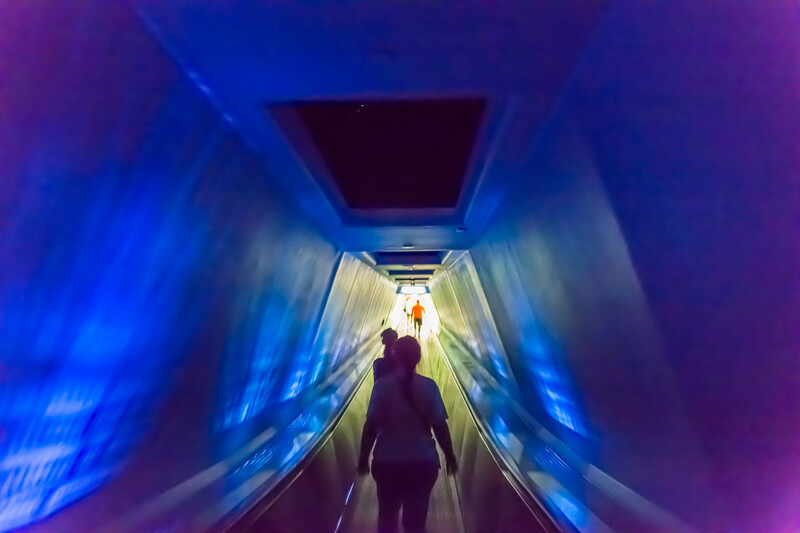 Heading out of Space Mountain. I love the lighting in this tunnel on the way back out. He was a neighborhood stray that looks similar enough to a rescue kitten that had gone missing shortly after we first let him outdoors that he picked up his name. The original (I’ll call him Munchkin beta as the cat that just passed from this world earned full title to the name over his many years with us) was adopted with his brother butterfly. After butterfly died of liver disease, muchkin beta went out one day and didn’t come back in. Some time after that we saw a black and white stray around the neighborhood that from a distance looked like the original. He didn’t want to come in the house and quite a few folks were feeding him so we just let things ride, assuming that our Munchkin had gone a bit wild and keeping an eye on things. One day, Munchkin arrived at the door with his head an neck pretty badly ripped up and he walked right in and lay down in the house. We took that as a sign and brought him in to get his wounds cleaned up. At the vet, they mentioned that he was unfixed which pretty much dismissed any possibility that he was the original cat come back. We got him fixed and vaccinated and from that point forward he was part of the household. He still ruled his stretch of the neighborhood and roamed far and wide. He became a wonderful pet who loved laps (but hated kissed on the head). A bit of a grey and drippy day outside. Starting to get traction at KMC and feeling like I’m going to be contributing significantly in the near future. Nice to be getting there as at Kiva/Amazon it never really felt like I was going to make a significant difference. Buried Eva last weekend. She was a good little cat and didn’t deserve whatever congenital problem did her in. I hate putting down a pet…I am particularly sad when the critter is young and otherwise doing well. We adopted her last fall before Alyssa went off to boot camp. One of Alyssa’s friends had a stray they couldn’t or wouldn’t keep that they were feeding outside. We adopted her and took her in. She took a little while to settle in, but in the end she had established her place in the house. She liked Lorna more than she liked me (she’d accept pets, but never really trusted me). She was in the process of domesticating Yagami and she really disliked Khan. Otherwise she seemed to have a ‘you don’t bother me and I won’t bother you’ attitude. Lorna is flying out to Chicago soon to visit Alyssa. Lys seems a bit stressed by things…and I do understand. She’s got school to deal with, friends coming and going around the training center as they start and finish their own training, a serious boyfriend in the process of deploying to Peal Harbor and I think she worries that home is changing/slipping away. Hard transitions to make, even when you’re able to come home on the weekends from college…she’s dealing with them far from home and with no chance of visiting for some time. I feel for her and will try to do what I can to help provide a stable point of reference. I think Lorna is pretty stressed at the moment as well. Between putting Eva down, Leo being in the hospital and the trip (which always stresses her even though she tries not to show it) she’s a bit on edge. I’m starting in on building the ‘catio’ to allow the boys some outside even when we’re not letting them out the door of the house. We’ve bought a bunch of the piece parts (wood, hinges and such for the door and lots more deck screws to hold it all together). I’m adjusting the design to add a sloped roof with shingles (from the brick or two that we had left over). Lorna wanted a top rather than the wire top that the original design called for. The option in the plans she got was for a flat roof made of plastic (not sure where they get polycarbonate panels, but the local home depot doesn’t have them). Given our sometimes snow loads in the winters, a flat roof seemed like a way of asking for trouble. This will be a one to two pitch roof with standard roofing shingles on top. Should do the job and look reasonable as well. I’ve cut the base 4x4s and dropped them in place by the side of the house. I’ve also cut an angle template to help set the table saw tilt for the long rip on the top board that the roof sheet will attach to. There’s still a good bit of figuring out to do before this project is done, but I think we’re headed in the right direction. Next step will be to bed the 4×4 timbers a couple of inches into the soil of the garden to lock them into place. After that is done I can start putting the main frame of the structure together. Lee should be coming home from the hospital soon. Hoping that he can keep up with moving around on a regular basis. This cellulitis thing has been a bit scary. I believe that he went in on Friday and he may be coming home today. Lots of antibiotics along the way and hopefully a bit of a wake up call. I’ve got to figure out how to partition these posts between public stuff and private. Ideally there’d be some sort of tagging on the post, but I don’t expect that to be supported here. Plan B would involve keeping two posts every day, one public and one private. Not sure I’m up to that so there may just be the private one for now.